We last heard from the Tanesashi Maru on January 22. Hopefully she is still sailing out there! The Tanesashi Maru was launched overnight and is now sailing in the Pacific towards North America! Her new keel has been attached and the Tanesashi Maru is currently waiting for a second and successful deployment. Launch day, December 20, 2017. She was placed in the water by Mr. Nakamura’s (head of Okuki Branch of Minamihama Fishermen Cooperative) crew 20km into the Pacific Ocean where the offshore currents converge. Unfortunately, very quickly after launching she lost her keel and a large wave knocked her over. After three passes Mr. Nakamura’s crew was able to get her back onboard. 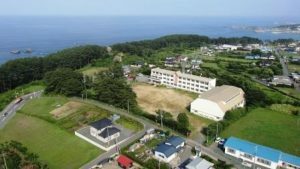 All the participating Mini-Boat schools in Hachinohe, Japan gathered at Okuki Elementary for a very special launching ceremony attend by government officials, members of the community, and national and international press. 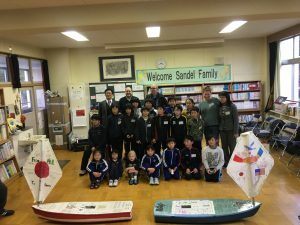 The Columbia River Maritime Museum’s Education Director delivered the S/V East Ocean Friends to Tanesashi Elementary School. The Japanese students opened the cargo hold to find gifts of salt water taffy from the students of Hilda Otto Petersen Elementary School. The students Tanesashi then got to work decorating their side of the sail and epoxying the name on the transom. 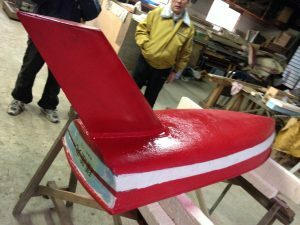 Hull #005 was built by the students of Otto Petersen Elementary School in Scappoose, Oregon and was named 種差丸 (s/v Tanesashi Maru) by the students of Tanesashi Elementary School in Hachinohe, Japan. She is part of the Transoceanic Classroom developed by Educational Passages and the Columbia River Maritime Museums Mini-Boat Program. The Oregon students placed letters and locally significant gifts in the cargo hold for the Japanese students to open upon its arrival in Hachinohe. 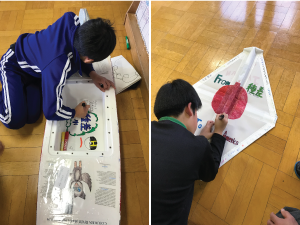 The students in Japan will place letters for their new American friends in the cargo hold to be opened on arrival onshore in North America.